For the first chunk of time as a record collector, I had a tough time finding the novelty of 7″ records – it ran parallel to my preference for albums over songs. But recently I’ve seen the light: there’s a special charm to them when they’re produced right, and the folks at Gubbey Records are making sure to do just that. Upon opening the package that I found in my mail last week (getting packages is another favorite thing of mine,) I found a multitude of things included in the plastic sleeve. Other than the bubble-gum pink vinyl (we’ll talk more about that later,) there were inserts that gave information about the artists, the songs on the forty-five, a mini-poster for the release party, and a download card that granted access to another five songs, digitally. Not a bad deal for the five dollars they’re asking for their last two split 7″ records on their online store. 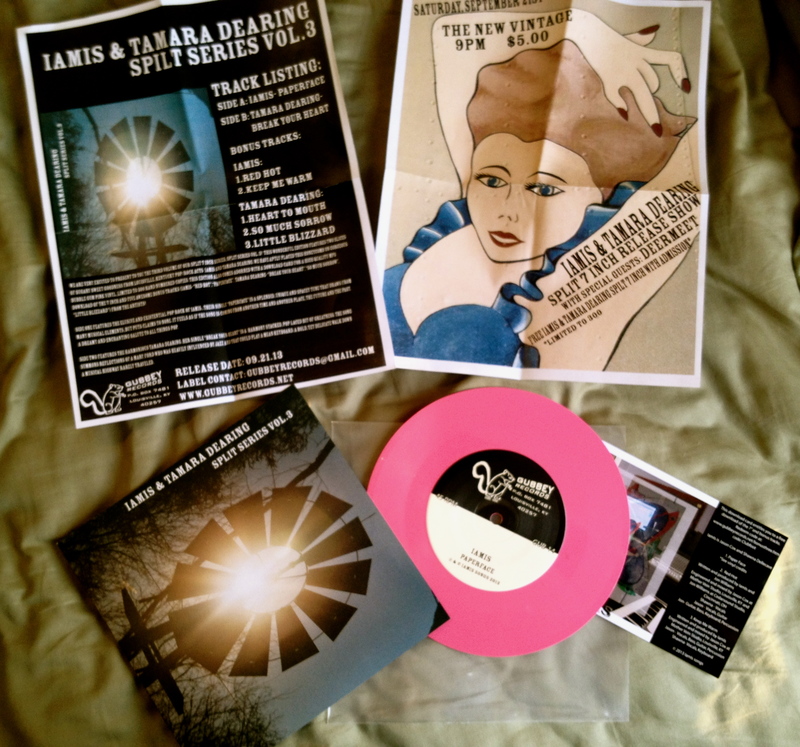 The music and the vinyl itself are both great too – the poppy sounds of Iamis and Tamara Dearing make a good pairing for the opposite sides of the candy-colored record. Both songs remind me a bit of fellow Kentuckians, Big Fresh, and Dearing’s voice shares some quality with Fiona Apple at times. Where I’m a fan of the limited edition pressings that folks like Soul Step and Third Man put out, this one fits right along – it explores a totally different genre than Volume 2 (some super noisy jazz was involved,) but keeps some common elements involved, placing the artists at the forefront of attention.